Serena and Venus Williams: The sisters used to write their own newsletter. It was pretty good! As teenagers, the Williams sisters published a newsletter that offers a rare glimpse into their minds, innocence, and humanity. Serena Williams (L) and her sister Venus hold their trophies after the women’s final of the Lipton Tennis Championships in Key Biscayne, Florida, on March 28, 1999. Heading into her historic calendar Grand Slam bid at the U.S. Open, Serena Williams has received more media attention than at any other point in her storied career. But before she stared out from the newsstands this week (gracing the covers of Sports Illustrated, New York magazine, and the New York Times Magazine), and before she won any of her 21 Grand Slam titles, Williams tried her own brief stint on the other side of the podium, tape recorder and notepad in hand. 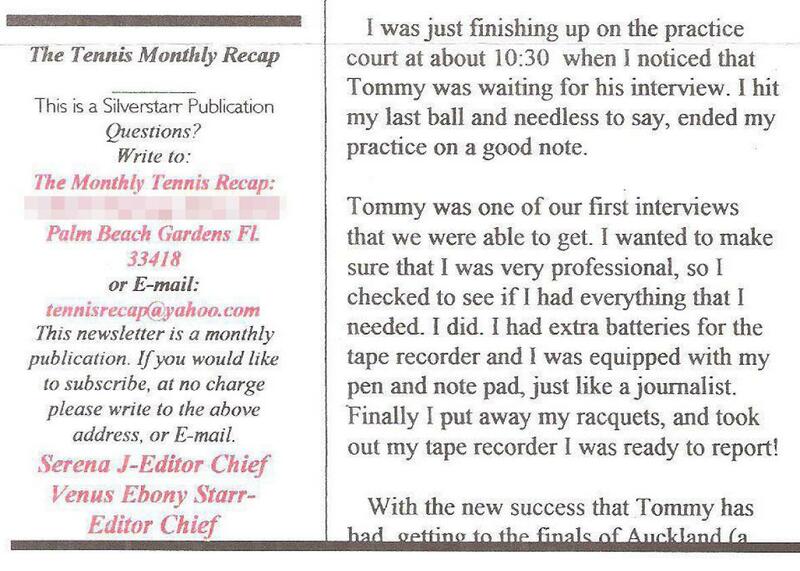 A copy of one 1999 edition of the newsletter offers a glimpse into the minds, innocence, and humanity of Serena and Venus that is a truly astounding artifact, a primary source for insight into two of the most overanalyzed figures in sports history. At a time when they were already two of the most talked about and polarizing athletes in the world, the sisters produced a newsletter that was at once playful yet professional, whimsical yet comprehensive, fluffy yet substantive. 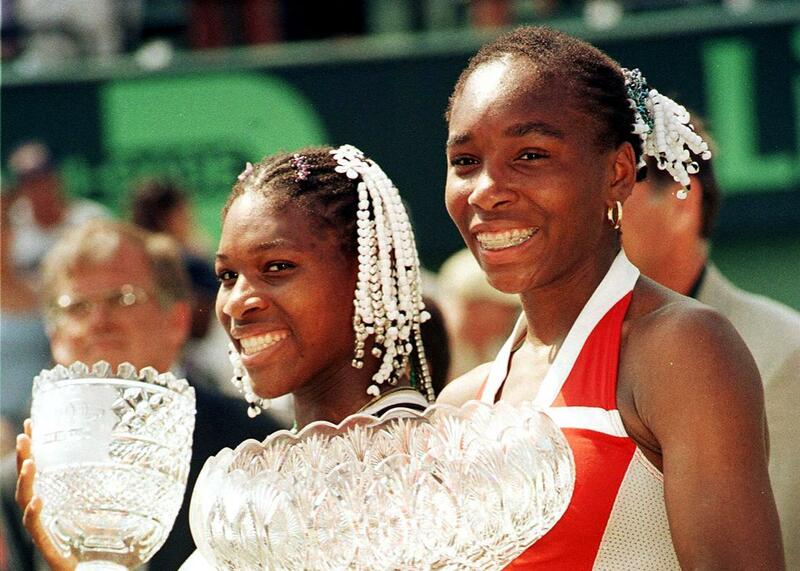 The precocious sisters, seen by many at the time as outsiders in the sport, took the initiative to start the newsletter in late 1998, when Venus was 18 and Serena was 17. They distributed their first copies of TMR the next year at the Australian Open, and attracted more attention months later when the newsletter was widely disseminated at a tournament in Key Biscayne. The idea bemused journalists at the time, who saw it as yet another inexplicable venture from one of the most enigmatic families in sports history. Asked about the endeavor in a news conference at that tournament, Serena said the original idea was from Venus. Despite the increasingly daunting scale of the project, Williams said she enjoyed being a journalist. “Maybe one day you will see me in here asking questions for the Tennis Monthly Recap,” she suggested. That wouldn’t happen, sadly. Though frequently mentioned in articles about the sisters in 1999, TMR and the memory of it understandably stagnated as the careers of both Venus and Serena soared. After a brief presence online at tennismonthlyrecap.com, the newsletter faded from view and memory almost entirely. This summer tennis lover and effectual archivist Stephanie Neppl found a perfectly preserved copy of the newsletter hidden deep in her stacks of tennis magazines and clippings. The newsletter’s masthead lists “Serena J” and “Venus Ebony Starr” under the title of “Editor Chief.” The issue found by Neppl was from March 1999, and is listed as their fourth. There is also an address in their hometown of Palm Beach Gardens listed, as well as the email address tennisrecap@yahoo.com. The majority of the first two pages are devoted to a feature interview titled “Tommy Haas: Der German King.” Serena, writing in first-person, describes not only the interview, but her own nervousness (“because lets face it—I am a tennis player, not a reporter!”) and her preparation for conducting it in an office at the Nick Bollettieri Academy, where Haas and Williams both trained. A copy of the March 1, 1999 edition of Tennis Monthly Recap. It reads like a well-written high school newspaper article or yearbook entry, with a strange combination of self-consciousness, self-absorption, and confidence. It’s exactly what you’d expect from someone her age, but not necessarily from someone who had devoted almost every day since she was 9 years old preparing to be the best tennis player on the planet. Serena sounds particularly confident, understandably, in her tennis analysis, describing Haas’ growing mental toughness and throwing in a bit of constructive criticism: “Tommy, although doing much better, can still use a little more patience and variety in his game.” Whether this is her own analysis, or she’s merely channeling Bollettieri—who she notes interrupted the interview at one point—it’s a direct and seemingly astute observation. It’s unsurprising that she’d be able to make that sort of assessment of a fellow player, considering she would ultimately come to understand the game as much or better than anyone in history, but her willingness to so publicly critique an older male player at 17 shows a gumption foretelling her future greatness. When I showed the article to Haas this summer (at 37, he is one of the few players remaining on tour older than 35-year-old Venus and 34-year-old Serena), it triggered memories of an unusual interview filled with laughter, but also remarkable dedication. Haas said the sisters marching to their own drum meshed with the reputation for independence that the family had maintained since first arriving at the academy, raising eyebrows for eschewing the typical junior circuit. He remembers the newsletter being received similarly: with initial trepidation, but ultimately garnering respect. Never a publication to pull punches, TMR then informs readers that Yevgeny Kafelnikov “appeared nervous” when he squandered an opportunity to become the first Russian man to claim the No. 1 ranking. Then, in another quick pivot, there is a reminder that their address and email availabilities are listed on the first and third pages of the issue and a note saying suggestions for topics and “comments on our tennis coverage in general” are welcome. That is followed by an update on the activities of the organization’s prides and disappointments, with the duo’s ambition for the project clearly apparent in a description of their ongoing efforts to secure a Pete Sampras interview. The March 1, 1999 edition of Tennis Monthly Recap. 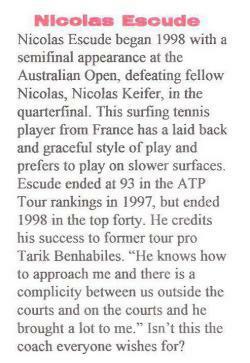 The fourth and final page of the newsletter is perhaps the most endearing of all: a spread detailing the available information on several players sharing the same first name, titled “The Nicolas’ of Tennis.” In an exhaustive survey of the rankings in the 1998 handbook for the men’s tour, TMR found five men with forms of the name in the top 250, and four from 251-500. TMR then explained its thinking, and in another sweet bit of sincerity, a disclosure for anyone seeking current, definitive Nicolas information. Of course, most of us do not pay much attention to the number of people in a sport with the same first name and TMR is not saying that you necessarily should, but we thought that all the readers out there would like to know the stories behind the men with this popular name. Venus, rarely one to betray much emotion, expressed some shock when I showed her the found issue of TMR last month at a tournament in Cincinnati. Serena, who had taken the lead with the Haas feature, was more impressed in looking back at her past work. While she struggled to think of what software they would have used to publish it, realizing it would have predated her exposure to Microsoft Word, Serena was particularly proud of the Nicolas idea—“we were smart back in the day”—and recalled TMR as a grassroots effort that may have foreshadowed the plight of print media in years ahead. Her days as a media mogul are behind her for now, but Serena has before never had a bigger audience, eager to see what history she will write. Maybe, after some well-deserved rest and relaxation in the off-season, Serena can update us about the six new guys in the top 250 named Nicolas.